Modena is the typical small city in the North of Italy, not far from Bologna and relatively near to Florence. Most people may know it in relation to beautiful cars like Ferrari, De Tomaso and Maserati. Food lovers will probably know that balsamic vinegar comes from Modena. The city itself with almost 200.000 inhabitants has a University that dates back to the 12th century. I went to Modena because I was invited for a two day conference there. The conference was organized in the main building of the University, the Collegio San Carlo: Italian, beauty, large staircase, lots of paintings, many rooms. We met on the Thursday afternoon and the Friday morning. The speakers from outside Modena were presenting their projects and their ideas on strategy in redevelopment. 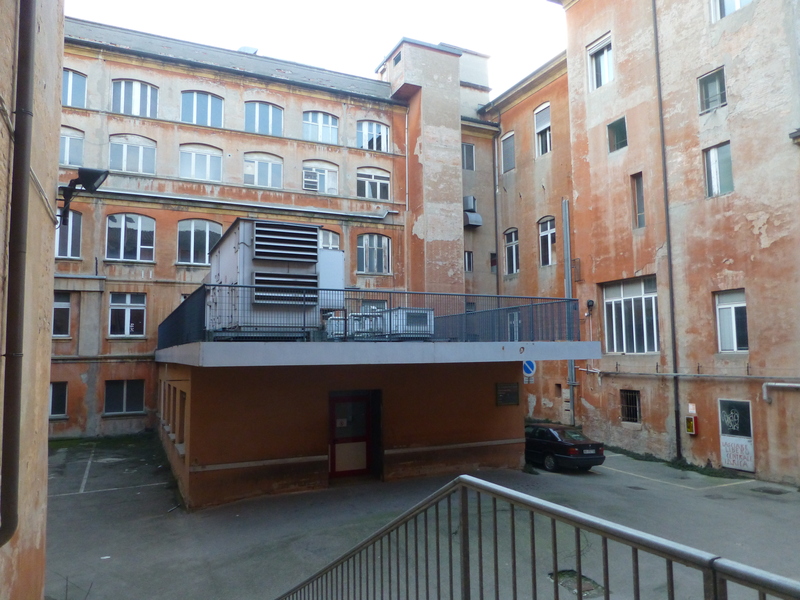 The speakers from Modena were referring to to the reuse of an enormous building on the edge of the inner city, the former hospital of Sant’Agostino. I went to see that building after the conference. It’s huge, it’s old, probably very beautiful but empty and in a bad state of maintenance. I can see the problem. Italian cities have so many beautiful buildings. With all the changes in the economy, with all the changes in services, it’s getting harder and harder to find the right program for a building like this. To save the building, to maintain it and to reuse it lots of money will have to be spent. The important question seems to be: is there a way to make that money come back. Is there a way to make the investment in a former hospital like this profitable? I thought that was very interesting. Education is indeed the main thing. Education is what makes the world go round. The main reason for migration is education. Cities without higher education can not grow. Experiment is another word for being creative. To try and do something new is what separates the one place from the other. And connection is very important as well: every project has to be connected to be found and to get there. The next day we listened to the Italian speakers. Emanuela Agnoli came from Ferrara to present her project Spazio Grisú. A group of people decided to reuse their derelict fire brigade building. More than any of the other initiatives this is a real bottom up project. It was incredibly interesting and I started to look at my IPad how far it would be to get me there. Not enough time for that, a little bit too far. Will have to see that next time. A reason to go back to Italy as soon as I can. Then a woman from Bologna presented a project and I did not understand what it was doing here. Since it was on my way to the airport I decided to visit that one. To find out that MAST in Bologna is an incredible space. MAST is a private initiative and hosts a lot of activities in a beautifully designed building on the outskirts of Bologna. I was so lucky to see the pictures of an amazing English photographer form the first half of the last century here: Emil Otto Hoppé. And after that left Italy with loads of questions. In the short time in Italy I saw it all. A top down project where a high quality was achieved with a strong program but a lot of money spent. A bottom up project that I didn’t see but immediately knew that is going to be a strong and good one in Ferrara. And a project that we all came for but didn’t see in Modena. A transformation project that probably needs a complete new strategy. Visited two weeks ago for the first time and loved it!